I recently read Sebastian Faulks’ attempt to be P.G. Wodehouse writing a Jeeves novel and looking at his earlier works I can’t imagine why they chose him. He wrote Charlotte Gray for goodness sake. And a Bond novel. And he denies that this is what he is doing “I’m just a fan” and doesn’t add so don’t blister my ear if I’m not Wodehousean enough for you, though frankly I don’t think you should shirk that if it comes your way. If you write a novel riding on someone else’s coattails, then accept the guff with the smooth. Or as in the actual Wodehouse novel I read immediately after (or rather sort of started midway) take a few smooths with a rough. But despite having a list of credentials which in no way seem to recommend him (Every cover is the sort of earnest piffle Bertram would steer clear of. Not a detective novel among ’em. ), he didn’t do a bad job. Rather good, actually. I don’t quite see the point because there are something like 80 Wodehouse books. Only the most dedicated could have run out. But here it is. Bertie, in the south of France (and here things get confusing because the one I read semi-simultaneously Right Ho, Jeeves, also has Bertie in the South of France at the beginning) meets a lovely girl named Georgiana Meadowes. Georgiana for reasons of filthy lucre and saving the old homestead is going to marry some blighter and Bertie and Jeeves end up in the same house trying to help Bertie’s friend marry his beloved, Amelia. That both of these girls are cousins in the same house is Wodehousean enough. Jeeves ends up (starts off, really) disguised as one of the upper crust which leaves Bertie below stairs. A novel device as far as I know and it works all right. Bertie still sounds fairly Bertie-like. The beloved is a good character and though there are too many worldly mentions it seems to me (Jarring, you see. Pulls you out of their world and into this. All wrong. But then what can you expect from a man who wrote a book called Human Traces?) 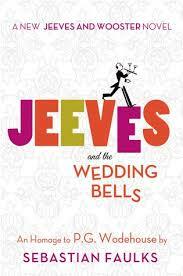 Jeeves and the Wedding Bells was entertaining and Wodehousean enough if you’ve read all the Wooster and Jeeves stories and desperately need a new one. But since it had been a while and I wanted to see if Faulks was as far off as he seemed when I was first reading it (I think I have to say he wasn’t. I was bothered at first by every little thing and later on just relaxed and read it.) So, I pulled up Right Ho, Jeeves which I’d put on my Kindle a year and bit ago. I read a lot of Wodehouse in my teens and twenties, but not much since. As I mentioned before the two openings are oddly similar. Bertie has been in the south of France. But in this one it was with his cousin Angela and Aunt Dahlia – the one he likes. There is conflict with Jeeves over his new mess jacket and further conflict with Jeeves over Jeeves’ support of Bertie’s old friend Gussie Fink-Nottle the newt fancier. I threw my mind back to the last time I had seen him. About two years ago, it had been. I had looked in at his place while on a motor trip, and he had put me right off my feed by bringing a couple of green things with legs to the luncheon table, crooning over them like a young mother and eventually losing one of them in the salad. (It made me laugh to imagine a fancy dress ball in which every male is dressed as Pierrot) which will give Gussie the courage to speak to Miss Bassett. Bertie is quite sure that Jeeves’ great brain has withered. Jeeves is past it. So, Bertie decides to solve this and all following problems himself. Here’s a hint how that goes: Dahlia starts calling him Attila. Plotwise the similarities are great: country houses, broken engagements, misunderstandings between young lovers, but laughwise Wodehouse wins hands down. 5, at least, to 1/2. But then what would you expect from a man whose next book is titled Where My Heart Used to Beat? This entry is belated not because I didn’t read it in time, but because I never got around to writing about it. Three weeks or so ago I finished Alan Melville’s Quick Curtain. I read a review of it somewhere and it sounded right up my alley – a huge West End musical sort of Busby Berkeley type production is interrupted by the shooting death of its star on opening night. It seems obvious who did it, but Inspector Wilson of Scotland Yard believes otherwise and with his reporter son they duly investigate. If you love witty, breezy, insouciant dialogue this book may be for you. If you love a good mystery, especially full of cunning twists and excellent clueing this book is not for you. Or me. I loved the theater atmosphere, the 30s setting, the banter between father and son. I even liked the way the first 50 pages or so are almost pure description – witty, insouciant description, but description nonetheless. This is a fun read, but not a good mystery. At the end it’s sort of like the author said oh, hang it and gave up entirely – so if that sort of disappointment will spoil it, steer clear. Others think differently and enjoy the end. We all enjoyed the light breeziness of the novel and I wish I could find it to find a few quotes, but oh, well. I did buy another of his because I enjoyed it that much. That should tell you something. I, of course, did not read this one, but the new British Library Crime Classics edition. Beautiful books. Looking forward to reading others. So, for RIP I did read 4 books. Not bad. Meant to throw in a short story and a movie or two, but there it is. I love this event and hope it happens again next year! Thanks to Carl and Heather and Andi for creating and hosting! Also using this for the Golden Age Mystery Bingo – it is definitely set in the Entertainment world. Simon at Stuck in a Book and Karen at Kaggsy’s Bookish Ramblings co-hosted a fun event – read a book from 1924 and report on it. Piece of cake, right? Well, apparently not for me. 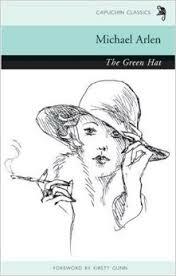 I started off with The Green Hat by Michael Arlen. What is it even about? I don’t know. I only read the first few chapters in which a woman named Iris Storm tries to visit her brother around midnight. Her brother is too drunk to receiver her. The neighbor below lets her in and is clearly fascinated with her. They chat until sunrise – a sort of boring, precious talk of Bright Young Things of 1924. I didn’t understand half their conversation. I also didn’t understand why, if he was moving, he sent all the bookcases ahead and left the books all over the floor. Surely this was odd behavior even in 1924? 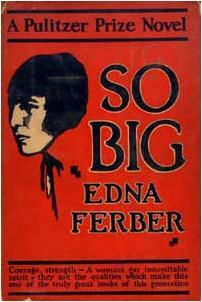 So, I could tell I wasn’t going to finish that in time so I switched to So Big by Edna Ferber. It won the Pulitzer for 1924 and I loved Saratoga Trunk, so I thought this will go better. And it did at first. It is much more readable. The daughter of a gambler goes to a good girls’ school, they eat well when he’s in funds and struggle when he’s not, but I enjoyed this first part. Then she’s on her own and apparently spends the next 10 years or something becoming a bedraggled farmer’s wife. Well, I might keep reading it, but bedraggled farmer’s wives aren’t my thing at all. 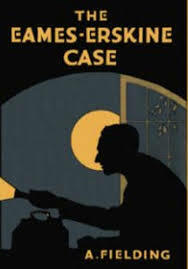 Plus it was still long to try to finish in the time left so I found on my Kindle A. Fielding’s the Eames-Erskine Case. Yeesh, what a horrible cover. A. Fielding or A.E. is an almost completely forgotten mystery writer from around 1924 for about 20 years. She wrote 25 mysteries according to The Passing Tramp which also includes an entertaining hypothesis that A. Fielding was a pseudonym for A. Christie trying out a different sort of writing. There are some similarities especially to her adventure books – a plucky heroine investigating and getting herself in trouble (she doesn’t show up until halfway through) and a marked respect for the police and their abilities. The story is strange and rambling and overly complicated. It opens with a man finding a body in his hotel room wardrobe. The young man inside was supposed to have gone to the country for the weekend, but instead apparently took a large dose of morphia. There are many issues with this right off the bat. For one thing, he apparently unscrewed panels from the back of the wardrobe, but how did he put them back? He can’t have, of course. And then, there’s no sign of the morphia or anything to drink it from. Very sloppy work, murderer. If you want to kill someone and make it look like a suicide, you leave the means of suicide with the body. If you can get past these peculiarities and many more, it is not a bad read. Chief Inspector Pointer is a good character, although his roommate whom he talks things over with is fairly useless. He goes off to France for reasons we don’t know until he reveals them at the end, which is annoying. It’s the sort of book that can entertain if you’re a forgiving reader and annoy the heck out of you if you’re not. I probably will try another Fielding at some point. This is either her first or possibly second book, so she probably got better. Spoileriffic addendum: Nope, the more I think about it the more senseless it gets. If you’re in a hotel and the wardrobe won’t open, don’t you call the manager or housekeeping? And if you do unscrew the back and then replace it, where do the extra screws come from which are later discovered in a suspect’s trunk? There shouldn’t be any extra screws. And I seriously doubt you can replace someone’s cough syrup with morphia, then put the cough syrup back and there are no traces of morphia in the bottle? This book is terrible. And yet not. Oh, someone else read this and let me know what you think.